Harmony Hawks Chorus, Cedar Rapids, Iowa. Proud Image Chorus is holding their 40th Anniversary show with guest quartet Boom Town on May 4th at 2p.m.and 6 p.m. The show will be held at Central Middle School. Tickets are $12.50 for adults and $8.00 for students. Sean Devine from the Harmony Foundation will be at rehearsal this week. Marty Monson, CEO of Barbershop Harmony Society, will be at Spring Contest. He will be attending the first part of our rehearsal. We will be going out for dinner with him, 5 p.m. at the Black Sheep Social Club, prior to our rehearsal on April 25. If you are interested in eating with Marty, please let me know so I can make sure we reserve enough space for us. See the detailed information below on helping Iowa City with the Spring Contest. They still need many people! Monday night we were contacted by BHS about warming up the mics Saturday at the contest. I have reached back to them to get more information. I should have more to share at Thursday’s rehearsal. 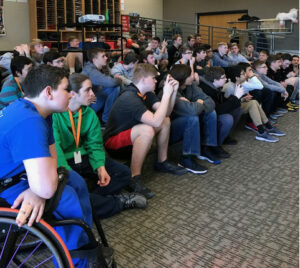 Thank you to Profound Sound quartet for continuing our youth outreach mission with their visit last week to Prairie Middle School. 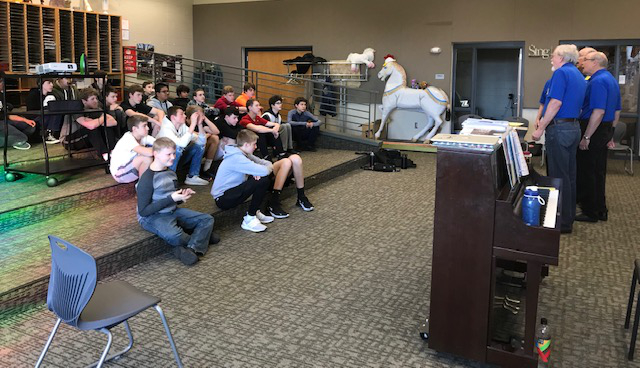 Profound Sound sings for Kelly Truax’s seventh graders at Prairie Point Middle school. 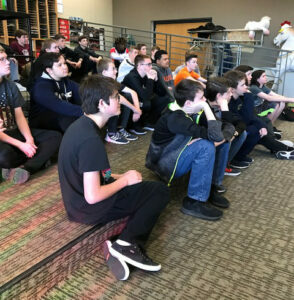 Kelly Truax’s students listen intently to Profound Sound’s performance at Prairie Point Middle School last week. This entry was posted in Board and staff notes, Weekly Updates and tagged a cappella, Barbershop Chorus, male chorus, mens chorus, singing. Bookmark the permalink.